A Software QA Engineer works with software developers in order to improve the software products during development stages. 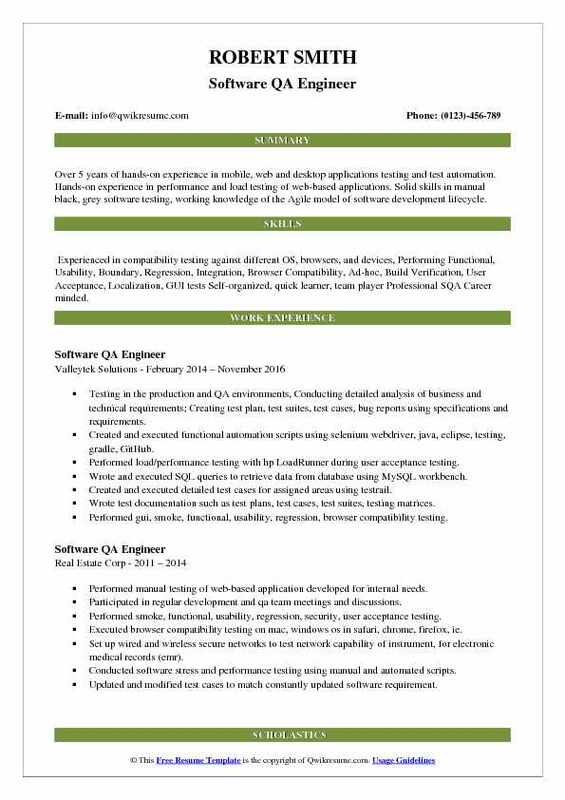 One of the key responsibility that can be seen in a Software QA Engineer Resume: testing on software and applications to find and analyze any kind of defects or bugs to improve products. Other responsibilities are monitoring, testing, and analyzing the software during all stages, simulating product performance, and evaluating and comparing the results to ensure the quality of the software. Some of the key skills needed for this role are the ability to document product problems and plausible solutions in a technical document, in-depth knowledge about various quality assurance strategies, knowledge in database management, data modeling, and software quality assurance testing. The educational qualification expected for this role is a Bachelor’s Degree in Computer Science or Engineering. Objective : 2+ years of experience in manual and automated black box testing of Web and Mobile applications Background in Industrial & Civil Engineering, Project engineering & management, Site management. Excellent knowledge of Software Development Life Cycle, Solid understanding of business requirements, software requirements specifications. Skills : Working knowledge of Web Automation testing with Selenium WebDriver, scripts and frameworks Experienced in Black-Box & Grey-Box methodologies, Functional, Regression, Exploratory, Smoke, Sanity, Integration, System, Unit, Load, Stress, Performance, Compatibility, Localization, End-to-end, Cross-browser/platform, GUI, Usability testing Easy adaptive team participant similarly efficient in team and personal assignments Experienced in installing and setting up test environments and performing backups. Testing desktop and mobile versions of the web application in QA and production environments. Develop flow based test cases under test plan and schemed functions requirements. Identify functional modules, structure, and logic for testing of the system internals. Develop and execute test cases and test suits for various functionalities. Conduct cross-browser testing in chrome, firefox, ms edge, safari in windows 10/8/7 and Linux. Perform functional, regression, and usability testing on mobile devices in wp8. 1, android, ios. Use fiddler (proxy application) to monitor, analyzes & report bugs if any. Develop and create test data, retrieve test data form servers by sql queries. Testing GUI and usability of new builds based on usability and web standards guidelines. Utilizing the bug tracking system and perform bug fix verification testing. Participate in weekly QA meetings to discuss the bug fixes and latest builds. Perform functional testing in production and QA environments, using adb of asdk, etc. Writing automation scripts to perform test cases with Selenium WebDriver, Eclipse, TestNG, Grid, Java Experience in conducting automation testing using Selenium with Java. Knowledge of Agile and Waterfall models of Software Development Life Cycle Hands-on experience in performing Functional, Exploratory, Regression, Functionality, Boundary, Browser Compatibility, Build Verification, GUI, Usability Tests Planning and optimization of the workflow process for maximum efficiency. Performing exploratory, functional, integration, cross-platform, GUI, compatibility testing. Verify the ability of the app to work properly and smoothly under the impact of all kinds of interruptions. Perform load testing for all kind of internet connections with different kinds of environmental conditions. Performing usability testing of the app on ease-of-use and friendliest user experience. Participating in project team meetings to discuss the testing process, business requirements, assignments. Utilize SDK-based android virtual device and. Apk files installation simulators for testing purposes. Analyzing software failures, make them reproducible, report bugs via Jira. Executing functional testing in order to make sure that all main and additional functions and features can work properly without high priority issues. Executing compatibility testing using selenium grid to make sure that app can work smoothly and equally for each environment combinations on different platforms, os, and devices. Executing smoke and regression testing using automation libraries selenium with java, testing. 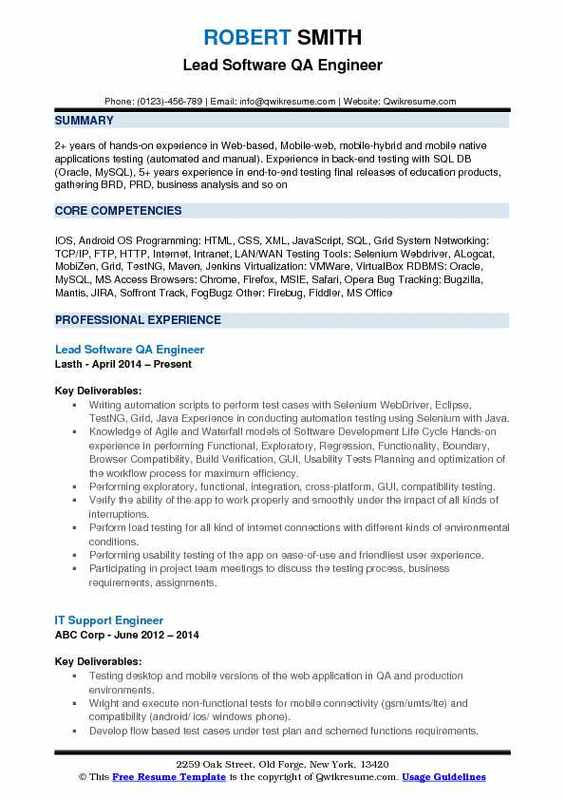 Objective : Over 5 years of hands-on experience in mobile, web and desktop applications testing and test automation. Hands-on experience in performance and load testing of web-based applications. Solid skills in manual black, grey software testing, working knowledge of the Agile model of software development lifecycle. 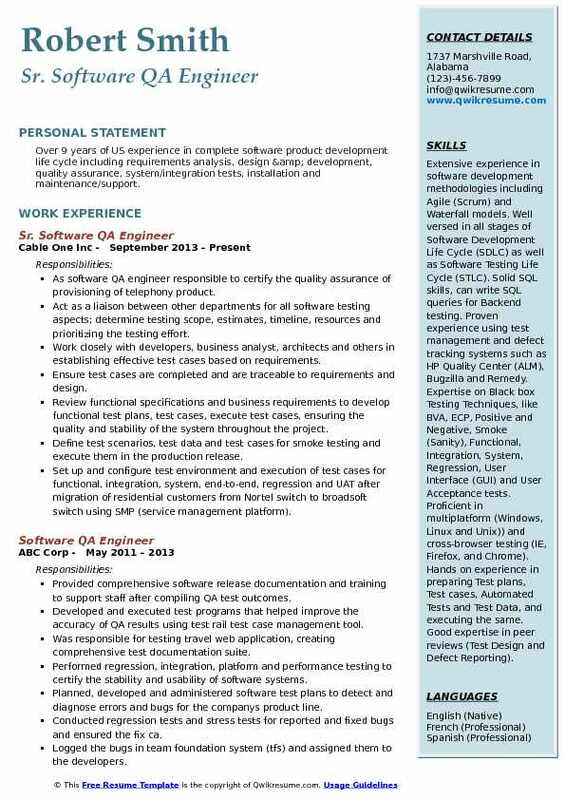 Skills : Experienced in compatibility testing against different OS, browsers, and devices, Performing Functional, Usability, Boundary, Regression, Integration, Browser Compatibility, Ad-hoc, Build Verification, User Acceptance, Localization, GUI tests Self-organized, quick learner, team player Professional SQA Career minded. Testing in the production and QA environments, Conducting detailed analysis of business and technical requirements; Creating test plan, test suites, test cases, bug reports using specifications and requirements. Created and executed functional automation scripts using selenium webdriver, java, eclipse, testing, gradle, GitHub. Performed load/performance testing with hp LoadRunner during user acceptance testing. Wrote and executed SQL queries to retrieve data from database using MySQL workbench. Created and executed detailed test cases for assigned areas using testrail. Wrote test documentation such as test plans, test cases, test suites, testing matrices. Performed gui, smoke, functional, usability, regression, browser compatibility testing. Analyzed software defects and reported them via Jira defect tracking tool. Participated in sprint planning, demo, daily stand-up, defect review and other meetings. Manually tested mobile applications on ios and android platforms using various devices. Analyzed software failures, made them reproducible, reported defects via Bugzilla. 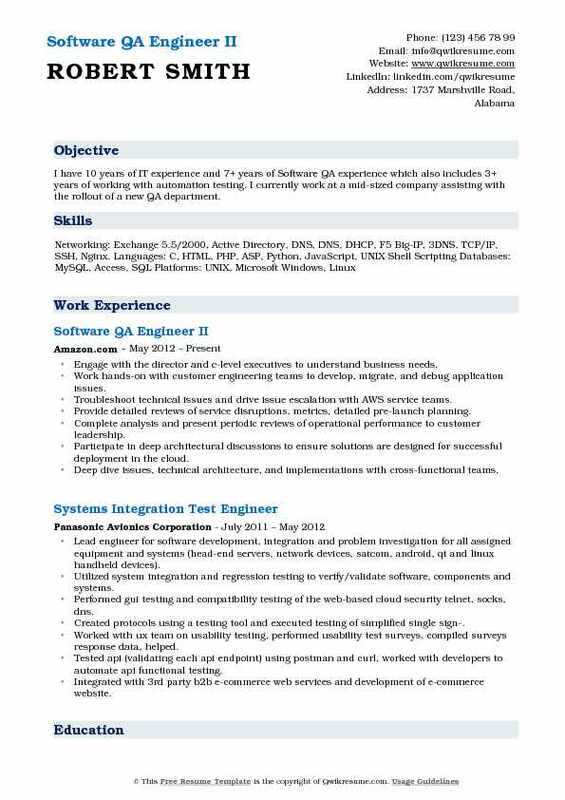 Summary : Over 4 years of experience as a QA Engineer with a solid knowledge of SDLC Analyze Business Requirement Documents, Functional Requirement Specification and Use cases to create test plans and test cases for manual testing. Perform extensive analysis of the functionality to be tested Involved in cross-browser testing Determine test plan time dependencies, defined scope of testing based on the requirements, formulate test case design approach. Create, write, and run test procedures based on customer-defined system requirements for a web-based healthcare client management application. Collaborate with peers, development team and business partners on test reviews. Examine and distribute test status reports, including progress, defects, risk, and potential impacts. Deliver effective assistance in estimating the testing effort by following defined quality assurance standards and processes. Design test cases and conducted test results per schedule to meet necessary testing requirements and updates in the testing repository. Supervise business and technical requirements in place for systems by executing quality assurance activities, including regression, end to end, functional, and integration testing. Document all testing processes and outcomes according to customer policies, providing strong data analysis and ensuring client satisfaction. Responsible for analyzing the requirements and the critical areas of the application to setup and execute baseline tests. Created requirement traceability matrix to make sure all requirements are met. Involved in designing test cases for different modules of the application according to the BRD. Summary : Over 9 years of US experience in complete software product development life cycle including requirements analysis, design & development, quality assurance, system/integration tests, installation and maintenance/support. Skills : Extensive experience in software development methodologies including Agile (Scrum) and Waterfall models. Well versed in all stages of Software Development Life Cycle (SDLC) as well as Software Testing Life Cycle (STLC). Solid SQL skills, can write SQL queries for Backend testing. Proven experience using test management and defect tracking systems such as HP Quality Center (ALM), Bugzilla and Remedy. Expertise on Black box Testing Techniques, like BVA, ECP, Positive and Negative, Smoke (Sanity), Functional, Integration, System, Regression, User Interface (GUI) and User Acceptance tests. Proficient in multiplatform (Windows, Linux and Unix)) and cross-browser testing (IE, Firefox, and Chrome). Hands on experience in preparing Test plans, Test cases, Automated Tests and Test Data, and executing the same. Good expertise in peer reviews (Test Design and Defect Reporting). 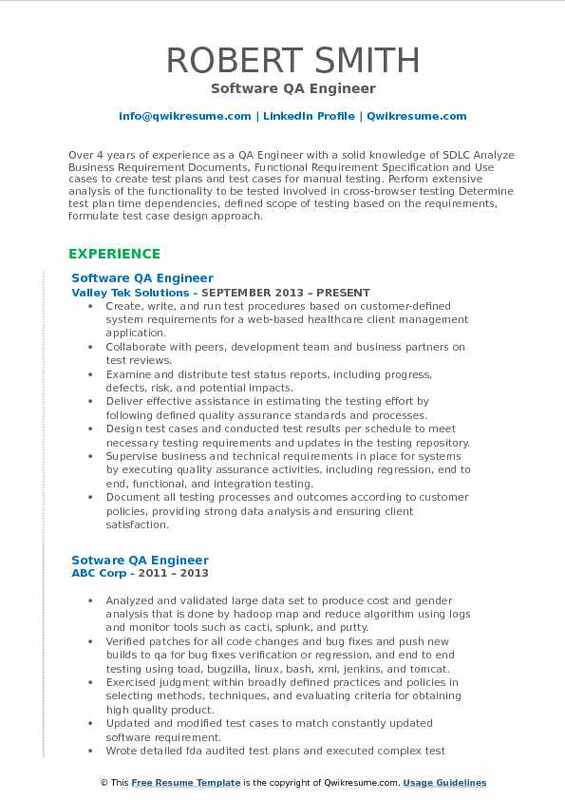 As software QA engineer responsible to certify the quality assurance of provisioning of telephony product. Act as a liaison between other departments for all software testing aspects; determine testing scope, estimates, timeline, resources and prioritizing the testing effort. Work closely with developers, business analyst, architects and others in establishing effective test cases based on requirements. Ensure test cases are completed and are traceable to requirements and design. Review functional specifications and business requirements to develop functional test plans, test cases, execute test cases, ensuring the quality and stability of the system throughout the project. Define test scenarios, test data and test cases for smoke testing and execute them in the production release. Set up and configure test environment and execution of test cases for functional, integration, system, end-to-end, regression and UAT after migration of residential customers from Nortel switch to broadsoft switch using SMP (service management platform). Execute sql queries on sql server 2008 and sql tables in order to view successful transactions and to validate data. Test web services, providing required input data to XML request and validate XML response. Participate in daily scrum meeting to follow the progress of the sprint and take necessary action as needed. Conduct defect triage twice a week to ensure that defects in the software products have been resolved, verified and communicated properly. Determine root cause of defects in the software and manage their lifecycle using existing defect management tool (Remedy & HP QC) to ensure quality assurance across various products, platforms, and releases. 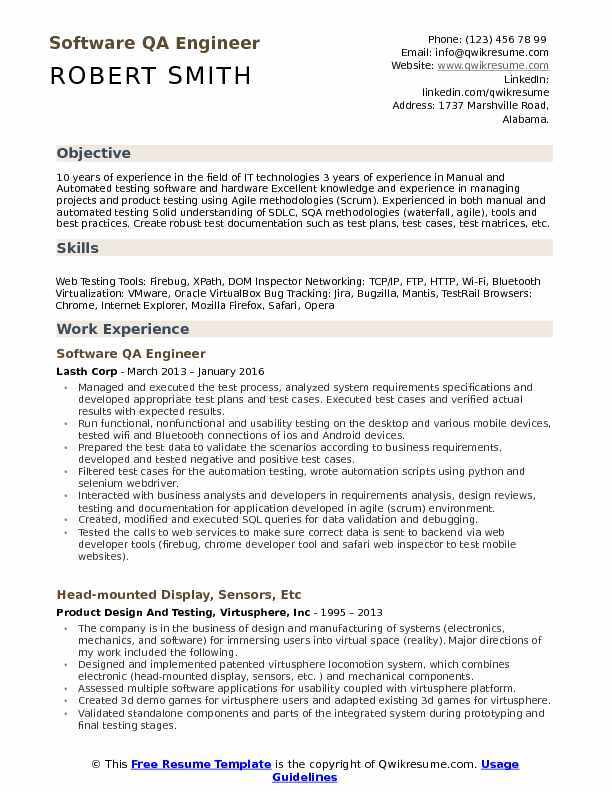 Headline : I have 10 years of IT experience and 7+ years of Software QA experience which also includes 3+ years of working with automation testing. I currently work at a mid-sized company assisting with the rollout of a new QA department. Engage with the director and c-level executives to understand business needs. Work hands-on with customer engineering teams to develop, migrate, and debug application issues. Troubleshoot technical issues and drive issue escalation with AWS service teams. Provide detailed reviews of service disruptions, metrics, detailed pre-launch planning. Complete analysis and present periodic reviews of operational performance to customer leadership. Participate in deep architectural discussions to ensure solutions are designed for successful deployment in the cloud. Deep dive issues, technical architecture, and implementations with cross-functional teams. Isolated, documented, regressed, and tracked bugs through a resolution for internal and external customers. Developed and executed test plans, test cases and UI automation for Kindle products. Summary : 12 Years of Experience In Software Quality Assurance Including Gray Box And Black Box Testing. Strong Background In Video, Audio, Web Based And Backend Testing. Solid Expertise In For Various Testing Telephony Clients And Interfaces (Web Based, Standalone And Voice Activated). Also Strong At Testing Web-based Manageability Interfaces for Administrators and End Users. Primary Job Responsibilities Include Defining Test Strategy, Development Of Test Plan, Test Cases And Design Of Test Beds. 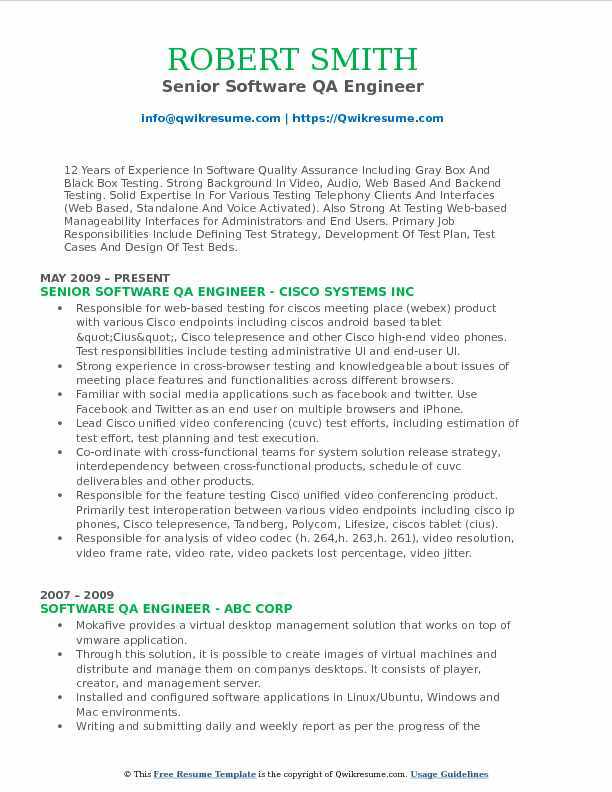 Responsible for web-based testing for ciscos meeting place (webex) product with various Cisco endpoints including ciscos android based tablet "Cius", Cisco telepresence and other Cisco high-end video phones. Test responsibilities include testing administrative UI and end-user UI. Strong experience in cross-browser testing and knowledgeable about issues of meeting place features and functionalities across different browsers. Familiar with social media applications such as facebook and twitter. Use Facebook and Twitter as an end user on multiple browsers and iPhone. Lead Cisco unified video conferencing (cuvc) test efforts, including estimation of test effort, test planning and test execution. Co-ordinate with cross-functional teams for system solution release strategy, interdependency between cross-functional products, schedule of cuvc deliverables and other products. Responsible for the feature testing Cisco unified video conferencing product. Primarily test interoperation between various video endpoints including cisco ip phones, Cisco telepresence, Tandberg, Polycom, Lifesize, ciscos tablet (cius). Responsible for analysis of video codec (h. 264,h. 263,h. 261), video resolution, video frame rate, video rate, video packets lost percentage, video jitter. Responsible for testing web user interface for Cisco unified conferencing manager and multipoint controller unit. Responsible for deploying the test bed for testing including cisco call manager, multipoint controller unit, Cisco unified video conferencing manager. Manage and track test execution progress on wiki displaying a graphical representation of test status for keeping cross-functional teams informed about test status. Feature test of Cisco unified presence server with the primary focus on testing presence integration with Microsoft exchange. Responsible for design of test topology involving cluster of Microsoft exchange servers, exchange server farms, single exchange server. 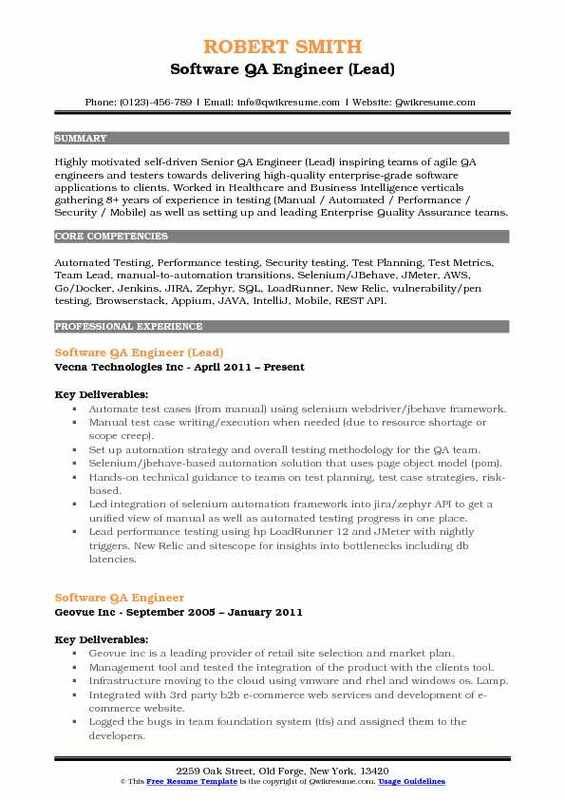 Summary : Highly motivated self-driven Senior QA Engineer (Lead) inspiring teams of agile QA engineers and testers towards delivering high-quality enterprise-grade software applications to clients. 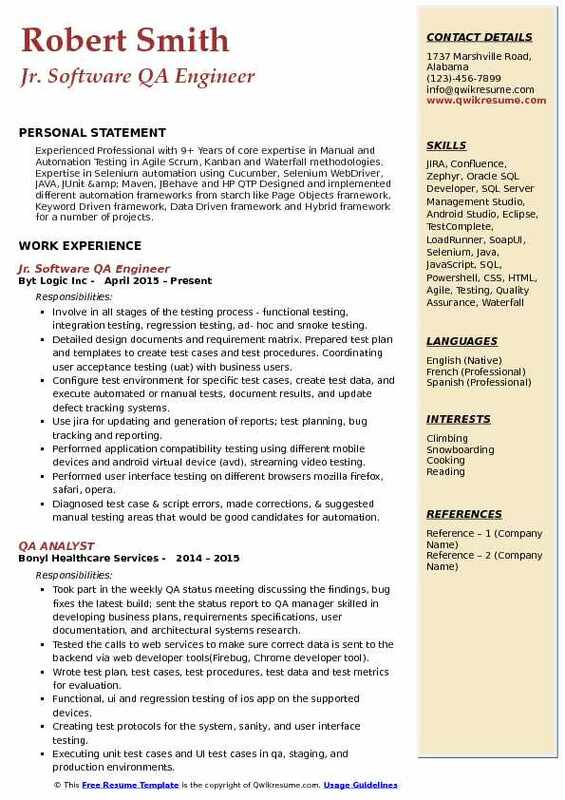 Worked in Healthcare and Business Intelligence verticals gathering 8+ years of experience in testing (Manual / Automated / Performance / Security / Mobile) as well as setting up and leading Enterprise Quality Assurance teams. Skills : Automated Testing, Performance testing, Security testing, Test Planning, Test Metrics, Team Lead, manual-to-automation transitions, Selenium/JBehave, JMeter, AWS, Go/Docker, Jenkins, JIRA, Zephyr, SQL, LoadRunner, New Relic, vulnerability/pen testing, Browserstack, Appium, JAVA, IntelliJ, Mobile, REST API. Automate test cases (from manual) using selenium webdriver/jbehave framework. Manual test case writing/execution when needed (due to resource shortage or scope creep). Set up automation strategy and overall testing methodology for the QA team. Selenium/jbehave-based automation solution that uses page object model (pom). Hands-on technical guidance to teams on test planning, test case strategies, risk-based. Led integration of selenium automation framework into jira/zephyr API to get a unified view of manual as well as automated testing progress in one place. Lead performance testing using hp LoadRunner 12 and JMeter with nightly triggers. New Relic and sitescope for insights into bottlenecks including db latencies. Evaluated restful web services/API testing solution, rest-assured that integrated into the existing selenium web driver automation framework. Set up and grew enterprise quality assurance team from a single member team to 10. Built capabilities in QA team via training/self-study to provide performance, security. 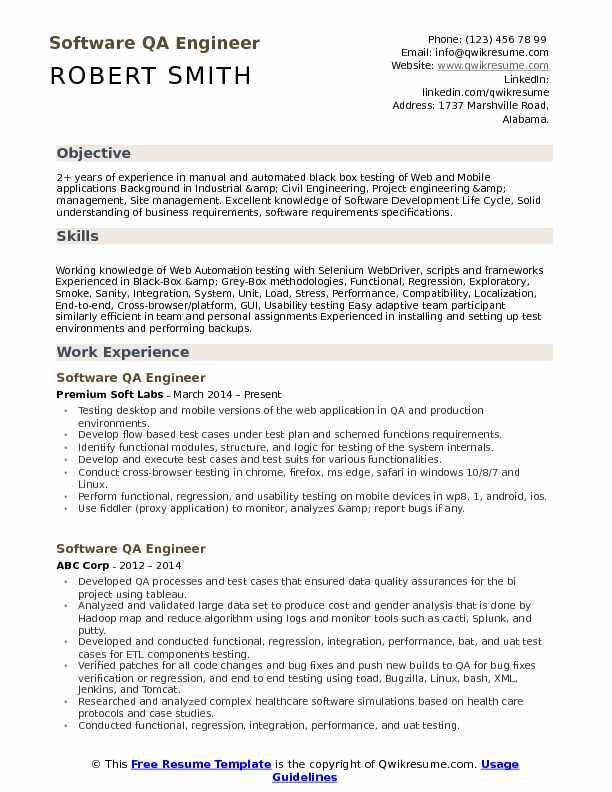 Objective : Experienced Professional with 9+ Years of core expertise in Manual and Automation Testing in Agile Scrum, Kanban and Waterfall methodologies. Expertise in Selenium automation using Cucumber, Selenium WebDriver, JAVA, JUnit & Maven, JBehave and HP QTP Designed and implemented different automation frameworks from starch like Page Objects framework, Keyword Driven framework, Data Driven framework and Hybrid framework for a number of projects. Involve in all stages of the testing process - functional testing, integration testing, regression testing, ad- hoc and smoke testing. Detailed design documents and requirement matrix. Prepared test plan and templates to create test cases and test procedures. Coordinating user acceptance testing (uat) with business users. Configure test environment for specific test cases, create test data, and execute automated or manual tests, document results, and update defect tracking systems. Use jira for updating and generation of reports; test planning, bug tracking and reporting. Performed application compatibility testing using different mobile devices and android virtual device (avd), streaming video testing. Performed user interface testing on different browsers mozilla firefox, safari, opera. Diagnosed test case & script errors, made corrections, & suggested manual testing areas that would be good candidates for automation. Discovered defects, reported, & reproduced the issues assisting in resolution. Updated the test cases to reflect future discovery of related issues. 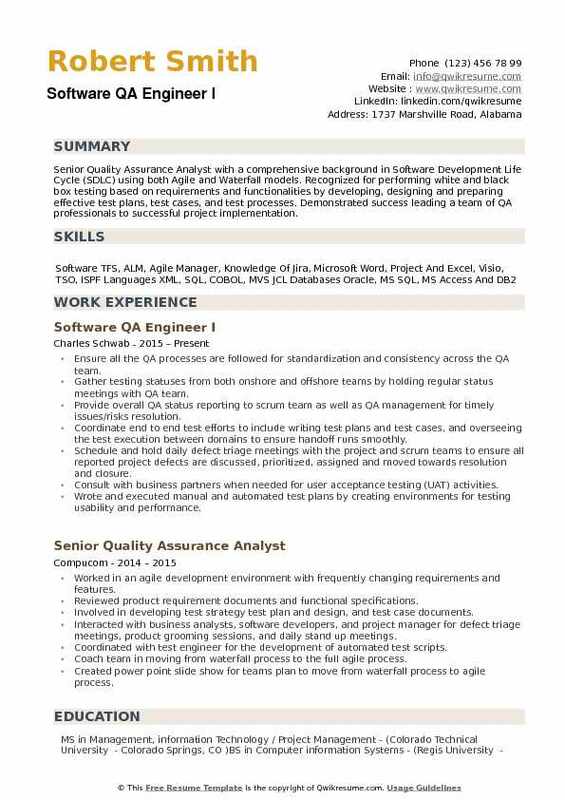 Objective : Senior Quality Assurance Analyst with a comprehensive background in Software Development Life Cycle (SDLC) using both Agile and Waterfall models. Recognized for performing white and black box testing based on requirements and functionalities by developing, designing and preparing effective test plans, test cases, and test processes. Demonstrated success leading a team of QA professionals to successful project implementation. Ensure all the QA processes are followed for standardization and consistency across the QA team. Gather testing statuses from both onshore and offshore teams by holding regular status meetings with QA team. Provide overall QA status reporting to scrum team as well as QA management for timely issues/risks resolution. Coordinate end to end test efforts to include writing test plans and test cases, and overseeing the test execution between domains to ensure handoff runs smoothly. Schedule and hold daily defect triage meetings with the project and scrum teams to ensure all reported project defects are discussed, prioritized, assigned and moved towards resolution and closure. Consult with business partners when needed for user acceptance testing (UAT) activities. Wrote and executed manual and automated test plans by creating environments for testing usability and performance. Summary : 10 years of experience in the field of IT technologies 3 years of experience in Manual and Automated testing software and hardware Excellent knowledge and experience in managing projects and product testing using Agile methodologies (Scrum). Experienced in both manual and automated testing Solid understanding of SDLC, SQA methodologies (waterfall, agile), tools and best practices. Create robust test documentation such as test plans, test cases, test matrices, etc. Managed and executed the test process, analyzed system requirements specifications and developed appropriate test plans and test cases. Executed test cases and verified actual results with expected results. Run functional, nonfunctional and usability testing on the desktop and various mobile devices, tested wifi and Bluetooth connections of ios and Android devices. Prepared the test data to validate the scenarios according to business requirements, developed and tested negative and positive test cases. Filtered test cases for the automation testing, wrote automation scripts using python and selenium webdriver. Interacted with business analysts and developers in requirements analysis, design reviews, testing and documentation for application developed in agile (scrum) environment. Created, modified and executed SQL queries for data validation and debugging. Tested the calls to web services to make sure correct data is sent to backend via web developer tools (firebug, chrome developer tool and safari web inspector to test mobile websites). Tested social web applications with over 27 million subscribers with clearly identified interests in activism. Was responsible for writing test cases for automation engineers on new features in bdd format. Performed cross-browser testing on a various mobile and desktop browsers.